What ever happened to the $19.95 oil change? The answer is that it disappeared, along with the “dinosaur” oils of the day. Using the $19.95 oil change as an example of the unique challenges faced by the auto repair industry in general, its original intent was to attract vehicles into the service bay for visual inspections that might lead to “tire, battery and accessory” (TBA) sales. But, today, increased component longevity is reducing the potential of a discounted oil change to produce the add-on sales. In most cases, heavily discounted fluid and filter services produce net losses rather than net profits. We’re no longer, for example, replacing V-type fan belts and hoses at three-year intervals. Instead, a modern serpentine belt lasts 100,000 miles and coolant hoses are life-time components. Service intervals themselves are also being extended from the time-honored 3,000 miles to more than 10,000 miles, which reduces the window of opportunity for add-on sales. And, instead of the $1.99 dinosaur oil and $3.00 oil filter, we’re now installing oils and filters that can cost five times as much. So, let’s explore how we can best meet the challenges of the modern fluids and filters market by looking at the costs involved. 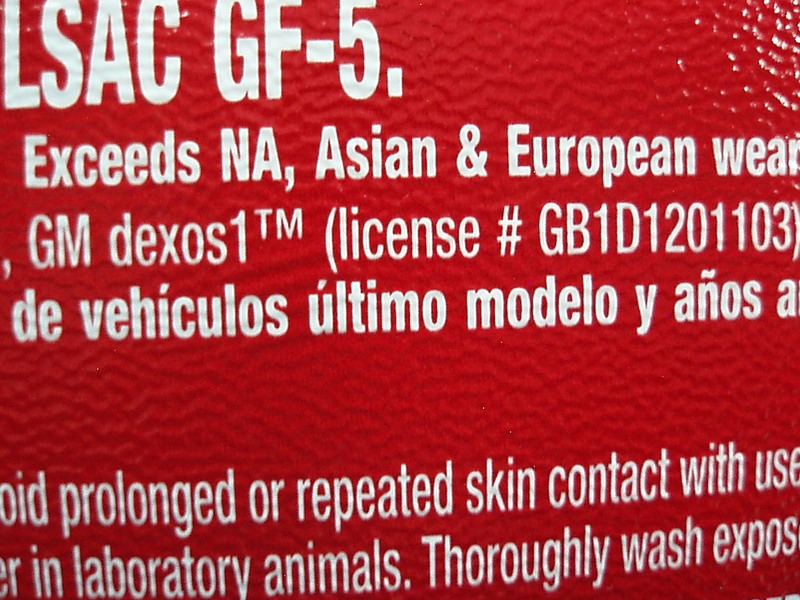 Photo 1: Modern oil labeling is very complex. 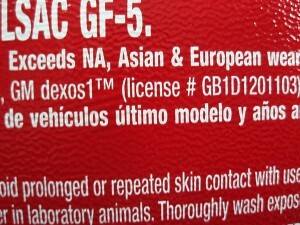 Along with meeting the ILSAC GF-5 rating, this oil bottle label lists a GM Dexos™ license number, indicating approval by General Motors. The oil also claims to exceed Asian and European wear requirements. Going back to the 1990s, waste oil disposal costs began to dramatically increase when waste oil disposal companies began charging, rather than paying for, waste oil disposal. In response, many shops installed waste oil heaters that essentially turned a negative cash flow into a positive cash flow situation. But, since some shops create more waste oil during the summer than they can consume during the winter, they again find themselves paying for waste oil removal. Volkswagen was one of the first import manufacturers to require application-specific engine oils during the 1990s. According to one oil manufacturer, 11 different engine oils are now required to cover Volkswagen gasoline and diesel engines. Most import manufacturers have programmed an Oil Life Monitor into their PCMs/ECMs that is designed to double or triple the conventional 3,000-mile oil change interval. The proliferation of part numbers required to establish a working inventory of oil filters is becoming an inventory cost issue as well. Adding to the cost of a routine oil change, the oil filter itself must be capable of filtering oil throughout the extended oil change intervals required by the vehicle’s Oil Life Monitor. Just recently, Mercedes-Benz advertised that its OE oil filters had at least 45% more filtering capacity than standard aftermarket filters. Additionally, all filters should be drained and crushed before disposal, which again adds to the labor cost of the conventional lube, oil and filter change. See Photo 1. Other technical issues that increase the cost of application-specific engine oils are Gasoline Direct Fuel Injection (GDI) and turbocharging. Oils designed for GDI engines must incorporate a high degree of scuff resistance for the high-pressure pump cam follower and eccentric, which is accomplished by using more expensive base oils and additive packages. GDI engines also have major problems with carbon forming on the intake valves, which causes engine misfires due to poor valve seating. Other concerns for GDI engines include increased timing chain wear caused by hard carbon particles suspended in the engine oil. The synthetic oil commonly used in GDI engines reduces oil consumption and piston ring sticking by increasing the flash point or ignition temperature of the oil itself. Turbocharging creates add-itional lubrication issues because exhaust-driven turbochargers routinely exceed operating temperatures of 1,000° F and turbine speeds of 100,000 rpm. When the engine is turned off, the extreme heat of the turbocharger housing can turn the shaft bearing lubricating oil into hard carbon. For this reason, engines equipped with turbochargers require a more expensive premium synthetic oil with a higher flash point that reduces the formation of hard carbon around the turbine shaft bearing and seals. 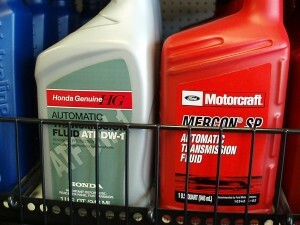 Photo 2: Here again found on a jobber’s shelf, the Honda ATF DW-1 and Motorcraft Mercon SP reflect the changing requirements of transmission design and extended service intervals. Many modern vehicles incorporate four-wheel or all-wheel (AWD) drivetrains. In definition, a four-wheel-drive vehicle can operate with one drive axle disengaged, while the all-wheel-drive vehicle must operate with both drive axles constantly engaged. The “accessory” drive axle in most AWD vehicles is usually driven by a non-serviceable viscous fluid clutch that compensates for differences in rotational speed in the drive axles. Most four-wheel-drive transfer cases include a low-range gear ratio to accommodate off-road driving. The transfer case might also be an “automatic” four-wheel-drive version that requires more expensive application-specific fluids designed with specific frictional, lubrication and longevity factors in mind. If an incorrect fluid is installed, transfer case service life will suffer and a performance comeback will likely develop. See Photo 2. 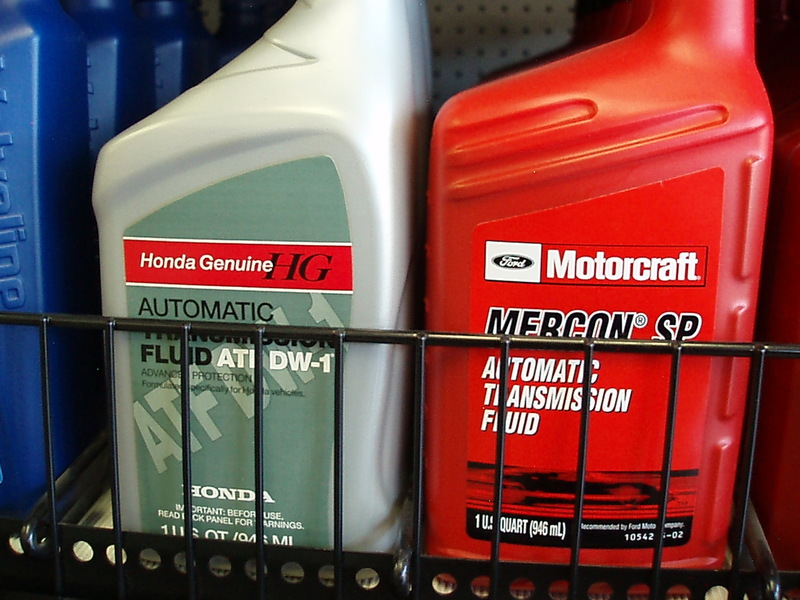 Like OE-spec transfer case fluid, automatic transmission fluids differ not only in their frictional coefficient, but in their compatibility with different friction materials, oil seals and sealing compounds. Constant variable transmissions (CVTs) found in many compact imports require an OE or OE-approved fluid for fluid top-offs. 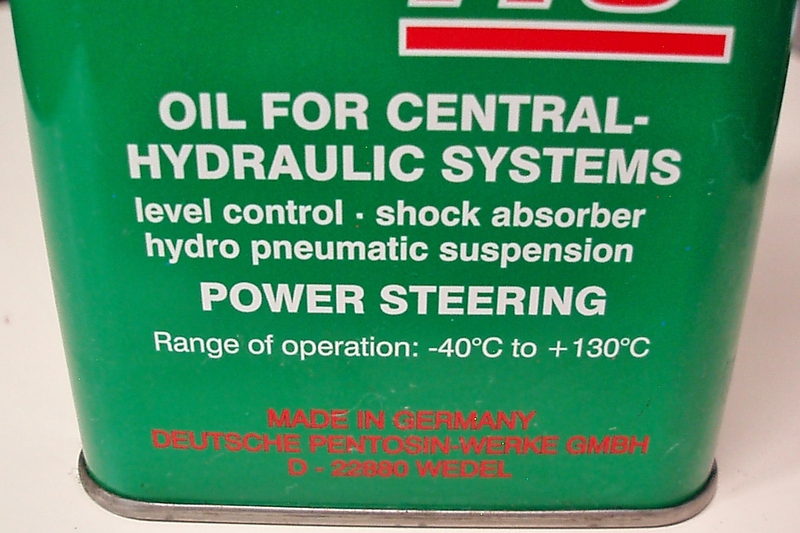 Power steering fluid must also meet OE requirements for resistance to foaming and seal compatibility. See Photo 3. The only entity capable of “approving” a particular oil or fluid for use in their vehicles is the vehicle manufacturer itself. If the oil or fluid is OE-approved, it meets the OE specifications. If the word “approved” isn’t used, the oil or fluid in some cases might not meet all of the OE requirements regarding lubrication qualities and service life. 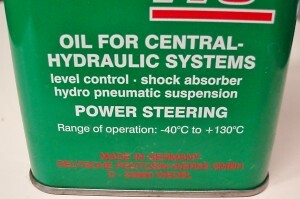 Photo 3: This power steering fluid is designed for some German nameplates. The label on the back of the can warns that this product is not compatible with other power steering fluids. Modern import shops should explore different management strategies to increase their profitability on fluid and filter services. It also goes without saying that a 20-bay shop can utilize a larger inventory in a more cost-effective manner than a two-bay shop. And, since the typical makeup of the automotive market in rounded numbers is about 50% domestic, 30% Asian, and 20% European in most areas of the continental U.S., the proliferation of fluid and filter types should be considered practically infinite. The most obvious management strategy to drastically reduce fluid and filter inventory costs is to specialize in one or two nameplates. Another strategy might be to adjust your fluid and filter inventory according to your core business. The core needs of an undercar shop, for example, are entirely different than an import specialty shop. Contrary to conventional wisdom, a few shops have eliminated on-demand fluid and filter services in favor of “scheduled” fluid and filter services. Because fluids and filters can be ordered in advance, the shop’s fluid and filter inventory can be drastically reduced. Other shops have simply replaced the conventional “oil change” with scheduled, bumper-to-bumper maintenance packages. While drop-in oil changes are basically eliminated, the shop’s profits are vastly increased with the use of a scheduled-maintenance model. Scheduling, coupled with selling the conventional fluid and filter service as a higher-priced “maintenance and inspection package,” should significantly improve the profitability of the lube-oil and filter service. And, thanks to oil-life monitors, some shops are now checking oil levels free of charge, which helps prevent the customer running his/her engine out of oil during an extended oil change interval. Being as wise as a fox, the modern shop owner knows that this free service provides his/her service writers with an opportunity to spot fluid leaks, worn belts and potentially bad batteries, which was the original intent of the $19.95 oil and filter change of 30 years ago. In addition to listing manufacturer approvals, the below label recommends its coolant for use in many import nameplates. During the 1990s, many shops began recycling the standard “green” ethylene glycol coolants for reuse in other vehicles. But, when application-specific coolants became popular, in-shop recycling became too labor-intensive for most production shops. In response, a number of mobile coolant recycling companies began reclaiming and redistributing recycled coolants. The upside of long-life coolants is the reduced need for recycling or disposal. The downside is that, when long-life coolants use up their additive packages or become contaminated with other coolants, the coolant must be recycled, which is another costly addition to a shop’s overhead. Like other fluids, coolants must be compatible with the materials found in modern cooling systems. The coolant must also incorporate an additive package that prevents rust and electrolytic corrosion found in bi-metallic aluminum/cast-iron engines. Coolants should also be environmentally safe and non-poisonous to protect pets and wildlife in the event of a spill. Lastly, a modern coolant should be capable of a 100,000-mile service life before its additive package is depleted. For all of the above reasons, most modern vehicles require an application-specific coolant. Several reputable coolant manufacturers now supply a “universal” coolant designed to top off or replace current OE-specific coolants. Reading the fine print, the cooling system must be thoroughly flushed before installing the universal fluid. Here again, a shop owner must be able to evaluate the advertising claims of the reputable coolant manufacturer or supplier. In many cases, the universal coolant will work as advertised. In other situations, such as in the high-end import market, the savings might not justify the risk of damaging an expensive cooling system.